News of a just-released publication entitled Global Piano Melodeon Market 2017 Industry Research Report reached me today. QY Research, a New York based market research company, are its authors. These kind of reports on the state of various parts of the music industry are fairly common, but I was initially a little confused by the term “Piano Melodeon”. Now this may be because I am based in the UK and we often call things differently to our friends across the Atlantic. However, I don’t think I’m alone here. So, at the risk of talking to the initiated, I thought I’d take a few words to clarify the subject, albeit in a rather superficial manner. Initially the term melodeon referred to a small reed organ, but now a melodeon is generally known as an accordion. This instrument, with the aid of straps, is worn on the chest of the player and is part of the free-reed aerophone family. This group also includes harmonicas, harmoniums, and concertinas. These instruments produce sound by blowing air over a series of tuned reeds, causing them to vibrate at the various desired pitches. A flow of air is created by the bellows, and controlled by small valves opened and closed, originally, by a series of buttons. Many kinds of accordion exist, but essentially there are two main types: diatonic and chromatic. A diatonic button accordion (DBA) has two or three rows of buttons with each row tuned to a certain key. Each button produces two notes, one when the bellows are compressed, and another when pulled apart (bisonoric). Just four buttons could therefore produce the chromatic scale. 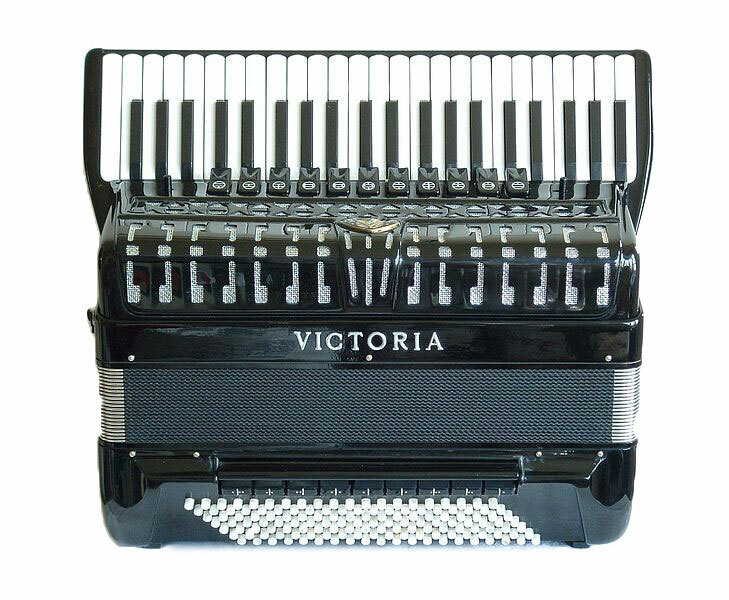 A chromatic button accordion (CBA) has up to five rows of buttons, each triggering just the one note (unisonoric). The use of buttons meant that these instruments could be much smaller. The button accordion generally has two sections, the melody or treble section and the bass section. A piano accordion, or piano melodeon is a CBA but uses a keyboard instead of buttons for the melody/treble section. The keys are smaller than those found on a conventional piano, and typically span around three octaves. The very first piano accordions were produced in the 1820s, but only from the 1850s did they become more widely available. Initially these were used as folk instruments, but from the beginning of the 20th century their appearance at the music halls and vaudeville establishments stimulated a much wider demand. In 1990 San Francisco declared the piano accordion the official instrument of the city. The first such instrument in America was (allegedly) produced here in 1908. So basically, as occurs quite regularly, the term “piano” refers not to the instrument, but to a chromatic piano-like keyboard. Maybe “organ-melodeon” doesn’t roll of the tongue quite so well?